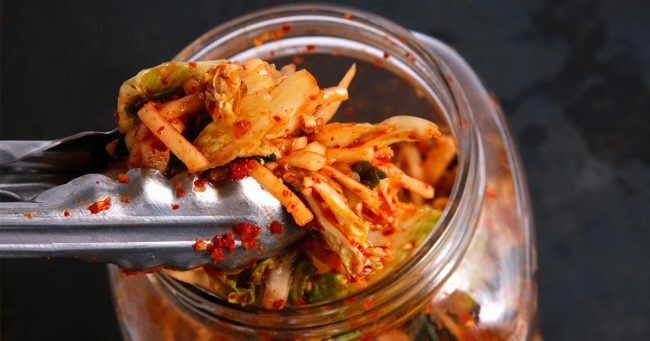 Kimchi is a tasty, probiotic-rich food which has been a staple in the Korean diet for centuries. It usually contains cabbage, scallions, red peppers, onions, garlic, and salt. The consumption of foods rich in probiotics offers numerous health benefits since the gut is the center of our health and wellbeing. Kimchi heals the gut, and studies have confirmed numerous other medicinal properties it contains. Namely, it prevents nutrient deficiencies and obesity, helps the digestion of protein, treats constipation, boosts the immune system, prevents tooth decay, and much more. Among others, studies by Professor Miri Kim at Chungnam National University showed that it is an effective way to prevent cancer, and detoxify the liver, kidneys, and small intestine. In a bowl, mix all the ingredients, and cover them for half an hour. Then, mash the mixture with a potato masher or a spoon to make it juicy and transfer it to a jar. Press the ingredients so that the liquid comes to the top. Leave 1 inch of space in a jar, and close with a lid. Leave the jar aside for 3-7 days, checking the level of the liquid daily. Store it in the refrigerator.